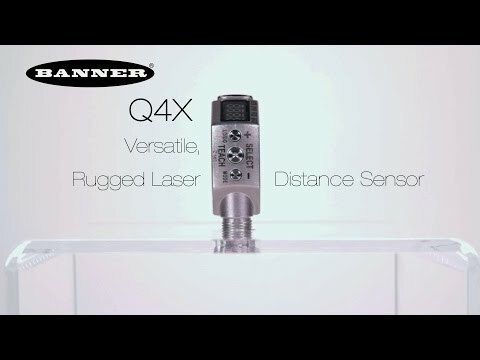 Minneapolis, MN—January 5, 2016—Banner Engineering announces its industry-recognized Q4X laser distance sensor is now available with dual discrete outputs and IO-Link configuration. Dual discrete outputs enable the Q4X to solve challenging high/low monitoring fill level or dancer arms applications, while IO-Link allows for remote configuration, sensor backup and easier preventative maintenance. The new Q4X dual channel sensor offers enhanced performance features, including window size and offset control for easier setup of difficult applications, totalizer to reduce PLC programming for high speed counting and pulse frequency modulation (PFM) output as an alternative to an analog output. Additionally, the IO-Link point-to-point serial communication protocol allows complete remote accessibility to device and event data and more precise, digital data transmission. With the capability to detect height changes as small as 0.5 mm and sense up to 300 mm, the Q4X can solve distance-based applications regardless of target surface reflectivity, including black foam on black plastic, black rubber in front of metal, multicolor packaging and targets of all colors. It is also optimal for clear object detection and error-proofing applications. Q4X Serisi lazer mesafe ölçüm sensörü birçok zorlu uygulamaya çözüm sunar. FDA onaylı, IP69K koruma sınıfına sahip, paslanmaz çelik gövdeye sahiptir.